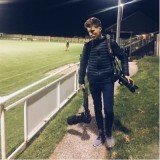 A photojournalism student has raised more than £5,000 in a bid to replace camera equipment stolen from him at a football stadium. Micah Crook, who studies press and editorial photography at Falmouth University, has been left without vital equipment after it was taken from him while he was gaining experience covering this month’s FA Cup tie between Fulham and Southampton. The equipment was taken from the press room at Fulham’s Craven Cottage ground while Micah, pictured, was getting food nearby, and the photographer says the theft has put a halt to his ambitions of becoming a professional photographer. He is now crowdfunding to raise £8,000 to replace his stolen equipment, and has so far received more than £5,000 of donations. In a plea for donations, Micah said he didn’t like asking for donations but felt he had “lost everything”. He wrote: “I have worked a part-time job on a fruit stall, grafting since the age of 15 to afford to purchase expensive camera equipment all by myself, accumulating enough professional equipment to photograph high level football and rugby matches. “I am completely devastated to tell you that today; my camera case was stolen from Fulham Football Club containing all of my cameras, lenses and laptop. I was hoping to photograph the game between Fulham and Southampton and whilst getting food from the media room, my gear was stolen from the pressroom. He added: “I will also have to pull out of photographing the Commonwealth Games, which I was set to photograph in Brisbane, Australia this April. It will also affect my studies of press and editorial photography at university, as I won’t have equipment to continue my work.